Jared Unzipped: The Honduran Death Machine Backed By Hillary Clinton. The Honduran Death Machine Backed By Hillary Clinton. One of the many riots that took place following the 2009 coup in Honduras. 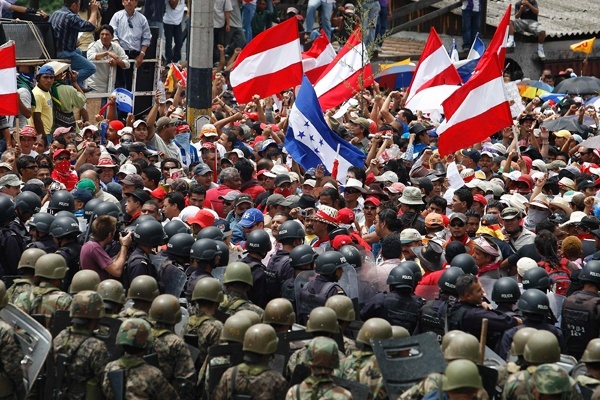 Seen here, supporters of the ousted President Zelaya clash with riot police. On June 28, 2009, a violent coup d'état erupted in the Central American Republic of Honduras. The death and turmoil that took place have not ended since. Many indigenous activists, defenseless citizens and those deemed unworthy by the new regime have been cleansed. That coup was wholly backed and facilitated by the US State Department, led by Secretary Hillary Clinton. 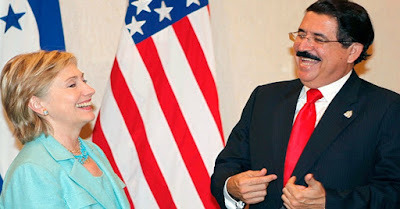 Former Honduran President Manuel Zelaya was a progressive leader. In his time as President, he supported making the morning-after pill legal. He wanted equal civil rights for LGBT citizens. Zelaya also supported numerous rural peasant and indigenous movements within Honduras, in an effort to preserve ancestral lands from mining, deforestation and dispossession. Since Zelaya's removal in 2009, the morning-after pill has been made completely illegal in Honduras, to be punished with the same severity as performing or receiving an abortion. Nearly two hundred known LGBT residents have been found murdered in the street, as of 2014. Even worse, multinational corporations seeking to generate valuable bio-fuel sources have moved in with ease, claiming land belonging to impoverished farmers. The Honduran countryside, once extremely rural and quiet, has now become a militarized death zone propped up by corporations and their private execution squads. Anyone that challenges the current Honduran leadership is apprehended without trial or simply eliminated. For forty five days after the coup, constitutionally-backed civil rights were paused -- no freedom of speech, movement, or assembly. Even worse, habeus corpus was suspended, meaning the government could detain anyone, anywhere, without probable cause or reason. If the members of the coup didn't like you, then they could jail you permanently without due process. Needless to say, Honduras is not a country you'll want to visit any time soon. So how does Clinton tie into all of this bloodshed? In the time before the coup, President Zelaya's willingness to help protect rural farmers against corporate interests was not supported by the American government. Making the situation even worse was Zelaya's policy of working with Venezuela via trade and mutual defense. If you'll remember, Venezuela (then led by Hugo Chavez) has long been a thorn in the side of the US foreign policy agenda in Central and South America. The drama with Venezuela is ongoing. After the coup took place, Zelaya and his government were removed and taken to Costa Rica by the Honduran military. Typically, events such as the coup that took place are deliberated by the Organization of American States (OAS). The OAS is a multi-national union of North, Central and South American countries, of which the United States is a member. And yet, when Zelaya arrived in San José, Costa Rican president Oscar Arias (a strong ally of the US), was tasked with moderating isolated talks with the leaders of the military coup and the deposed Honduran President. Clinton met with President Zelaya only once during the unrest in Honduras. That's right -- Clinton's State Department formulated an off-the-books mediation process, granting those whom committed the violent take-over equal footing with the legally elected Zelaya-led government. The OAS was to be circumvented. How do we know all of this? By law, US Government emails are routinely declassified for the public to read. The proof is right there in black and white. At least, the parts that haven't been redacted. The messages exchanged between Clinton (known as 'H' in email correspondence) revealed an intensely calculated series of maneuvers to keep the talks in Costa Rica going for as long as possible, even though they knew the talks would fail. That was the whole point, though. One of the many emails exchanged by Clinton during the turmoil in Honduras. Note the large swathes of her text that have been redacted. Long story short, Clinton and the State Department got what they wanted. The negotiations in Costa Rica ended miserably, leaving Zelaya deposed. The upcoming Presidential election in Honduras went as planned in November, 2009. Zelaya was restricted from completing his elected term. The new Honduran government, led by Porfirio Lobo, immediately became corporate friendly, flooding numerous international energy groups and US military assets into Honduras. In the eyes of the Clinton-led State Department, Honduras was suddenly on good terms with the US again. It couldn't be any more obvious that the turmoil in Honduras was a strategic play by the US and its mutual corporate interests, all in the name of profit and war. Not once has Clinton ever called what happened in Honduras a military coup. She's side-skirted the issue at every opportunity, as to never go on record specifically naming the atrocities that happened. And yet, Clinton claims to be a proponent of peace and prosperity. When you step into the voting booth and look at Clinton's name on the ballot, I ask that you to think of the people that have been affected in Honduras. Is this who we want to lead America?